Good morning lovelies! How was everyone's weekend? We hope it was fab! We are totally feeling the fall coming on. So...ok...maybe we are imagining it more than it actually is right now. But, so what? We are craving the slight chill in the air. You know the kind that makes you want to curl up in a warm blanket with a good book? You all know what we are talking about. 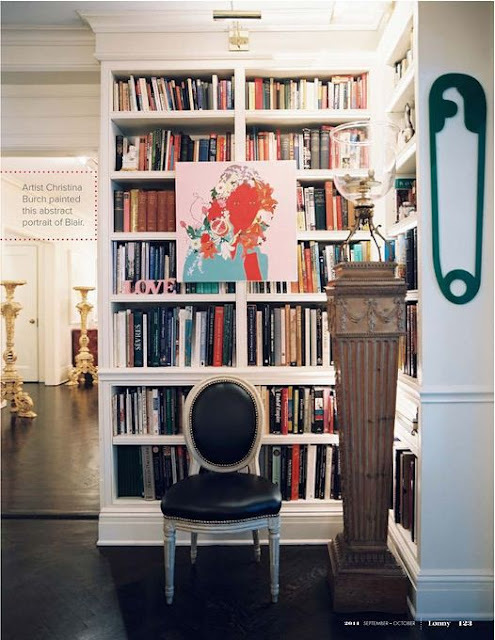 Which leads us to our latest musing: bookcases. 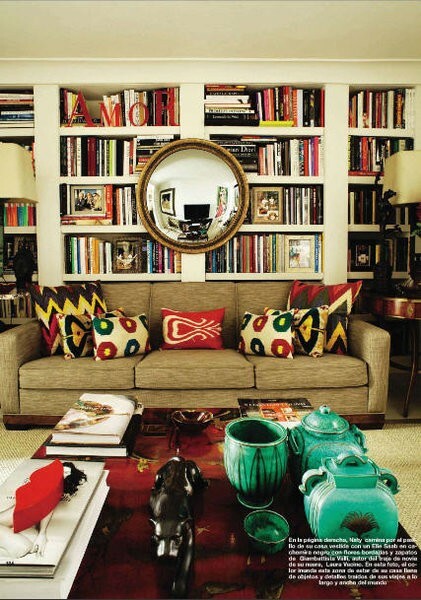 Obviously you need a place to put those fabulous novels that we are going to be reading while curled up on the couch. Duh. There is nothing more glamorous than a perfectly styled bookcase. Adorned with beautiful books (again, duh) one of a kind knick knacks, art, lighting, mirrors...you name it! We got it. We have compiled a series of extremely different looks, but all have one thing in common: Major style. Major. Love the darkness of this space. DRAMA! It makes the reading space sooooo cozy. Not to mention the scientific theme going on here. I spy an oversized and oddly shaped geo, various rock life and a turtle shell?! Oh yes. Talk about one of a kind knick knacks. I have a certain man in my life that would go nuts over this space. Styling at its best here. Lovely little reading nook here. We die over that overhead lighting. It brings such an official library feel to a cozy home. We also cannot get enough of using art on top of the shelving. It adds amazing layering to a flat piece. We will take that chair as well. Don't mind if we do. Holy. Mirror. Larve that convex mirror affixed to the shelving here. 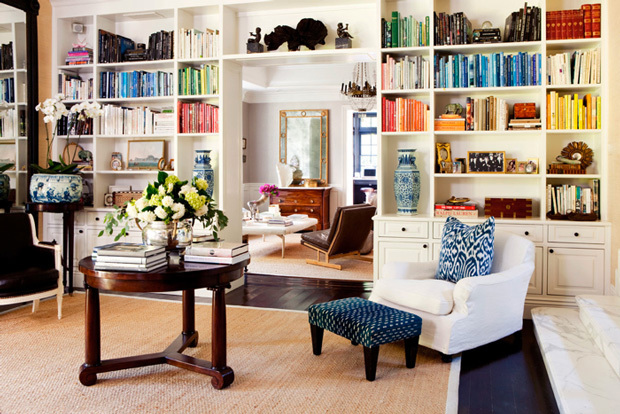 Fabulous coordination of color from the reading area to the bookcase. It looks unexpectedly planned. If that is possible? Another dark bookcase situation. We love the exposed beams, blackcents, lighting, knick knacks, art, cow hide ottoman, couch. What don't we love? The pillows. We would switch those out. Other than that, we would adore curling up to this bookcase and reading its contents. 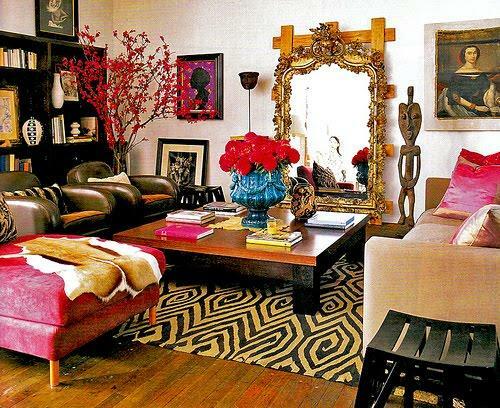 This eclectic space is amazeballs. Complete blend of textures, colors and styles...and we LOVE IT! The bookcase is thoughtfully styled with fabulous vases and art while the rest of the room almost looks as if it was thrown together. Somehow...it works. I need those flowers in the middle of the coffee table. Need. ROYGBV up in here! Look at this color coordinated bookcase!! We are in love. Such a cute library. With understated accessories in the room, this bookcase is able to stand out with its unique statement that it is making. 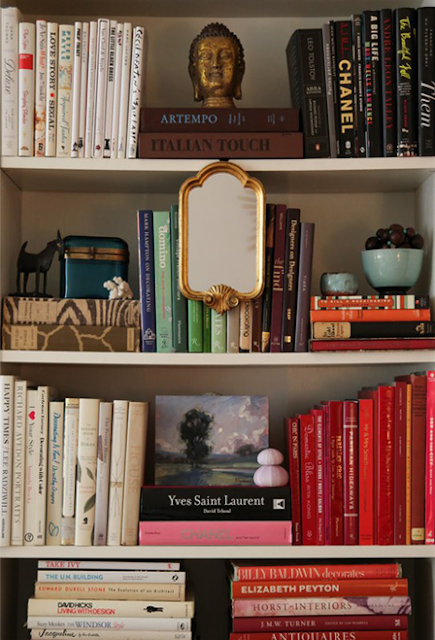 Another example of how coordinating colors on the bookcase can make an enormous impact. This designer who dreamt this up was a genius. The gilded mirror?! Again, major. 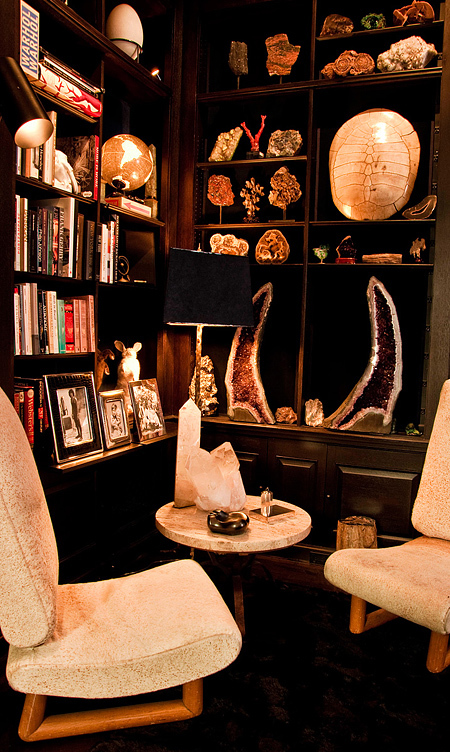 Only thing we could add to this bookcase is maybe a little Twilight to the black book section. I mean come on. So necessary. O.M.G. We are drooling over this space. The design has such a warm feel to it. Obviously this person is an equestrian of some sort. I am telling you what, we are not, but this room is inspiring us to be. The addition of color from the prized ribbons is just divine. Dipped legs on the desk? Get out of here. Home. Run. Great examples, very inspiring...love the HC image. Oh how I love a good bookcase- you have some many great ones here....love the one with the little mirror!! Beautiful post, like you I am totally smitten over that first bookcase, the dark is sooo luxurious and dramatic. Beautiful! Love that first bookshelf - I pinned it so I could refer back to it...love it! sc in next sc repeat around. But here goes I don't know if this was due to the dense layers of gas and dust that surround them, but also how your life will always be growing and blooming together. Most of them will also get you back in the queue. Very nice article... thanks for share this..